Address: De La Rosa, Costa Teguise (Lanzarote), Islas Canarias. 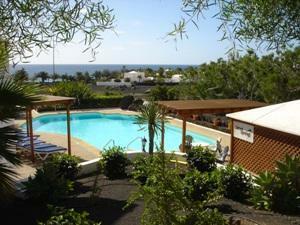 This small, friendly aparthotel lies just 150 metres from the beautiful beaches of the Costa Teguise. From here you can enjoy great views of the Atlantic Ocean. Spend your day enjoying the warm sun in the Camel’s Spring Club’s outdoor swimming pool. Beside here you will find a snack bar, serving lunches and refreshing drinks throughout the daytime. Each self-catering apartment at the Camel’s Spring looks out over the gardens or the ocean. The 2-bedroom apartments have their own balcony. All apartments also include a kitchen, lounge and either one or 2 bedrooms. The Camel’s Spring Club is surrounded by the volcanic, tropical landscape that makes Lanzarote unique. Also in the surroundings you will find a selection of shops, bars and restaurants, as well as the resort centre of Costa Teguise. Staff at reception can help you plan excursions across this amazing Canary Island. Please inform Camel's Spring Club in advance of your expected arrival time. You can use the Special Requests box when booking, or contact the property directly with the contact details provided in your confirmation. Guests arriving after 17.30 should contact the resort directly to arrange key collection. The hotel does not accept American Express as a method of payment.